Les plate-formes aériennes de travail à mât articulé (ou flèche articulée) servent à atteindre et à aller au-delà de machines, équipements, et autres obstacles qui sont montés au sol ainsi qu'à atteindre d'autres endroits qu'une nacelle à bras vertical télescopique aurait des difficultés à approcher. La tourelle permet une rotation à 360 degrés dans les deux sens. Le mât peut être levé et abaissé pour passer de la verticale à un positionnement sous l'horizontale et en extension (télescopé), la plate-forme de travail restera parfaitement stable et horizontale. Ce matériel multidirectionnel peut avancer, reculer et être orienté dans toutes les directions, y compris lorsque la nacelle est en hauteur. Tous les modèles articulés peuvent être conduits lorsque la plate-forme est à sa hauteur maximale et des largeurs de châssis donnant accès à des allées étroites et des lieux d'exploitation encombrés. The power assisted drive and lift functions are usually controlled by the operator (who may or may not use remote control). 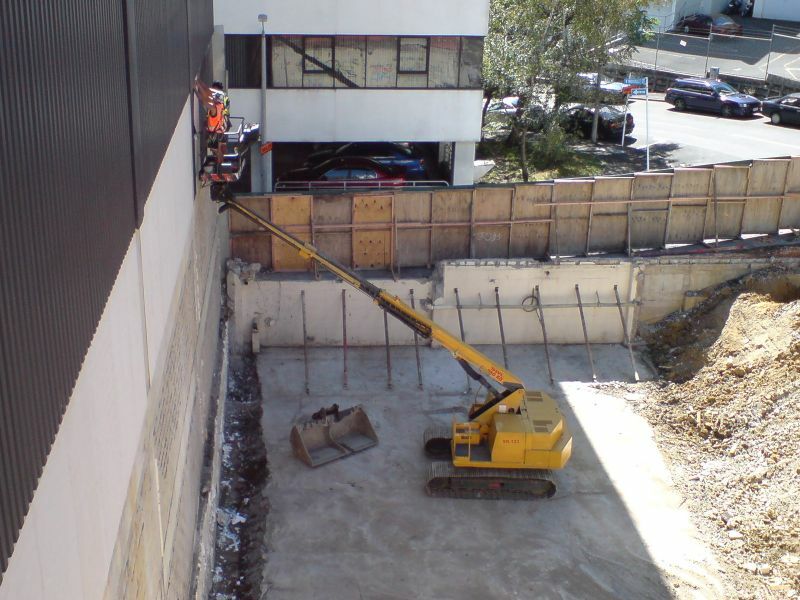 The operator often stands on the work platform itself, which, together with the varied safety features of most modern AWPs, allows the device to be used by a single person. AWPs are often bought by equipment rental companies,  who then rent them out to construction companies or individuals needing these specialised machines. The market for these machines is known to be marked by especially strong boom and bust cycles, and after a great demand in the 1990s (with up to 70,000 AWPs sold per year in the US) the market crashed in the early 2000s, leading to a strong contraction amongst the manufacturers. There are a wide variety of AWPs, usually distinguished by the way they 'unfold' from their rest state and lift weight. Also called boom lifts or cherry pickers , from their invention for fruit harvesting, these use multiple jointed sections that unfold to lift a platform or bucket. They are usually relatively small, as the boom lengths or the jointed sections are limited. They counteract this disadvantage by being some of the most flexible AWPs. 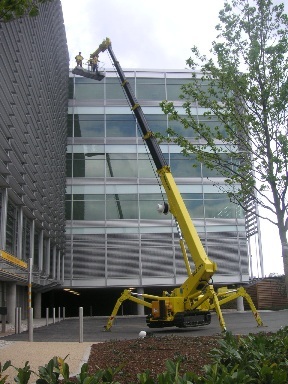 Articulated lifts are also often telescoping lifts (see below). These use linked, folding supports that draw together. While smaller, battery powered machines are used in warehouses for stock checking, or in maintenance tasks, large diesel powered machines with 4WD are used on construction sites for cladding installation or other heavier construction work. Screw lifts use screwlike threads to extend themselves. Rack and pinion lifts utilize a pinion driving a straight-toothed rack . Telescoping lifts have multiple overlapping sections that move into and out of one another. Telescoping lifts are also often articulated lifts (see above). A spider AWP set up outside a building. 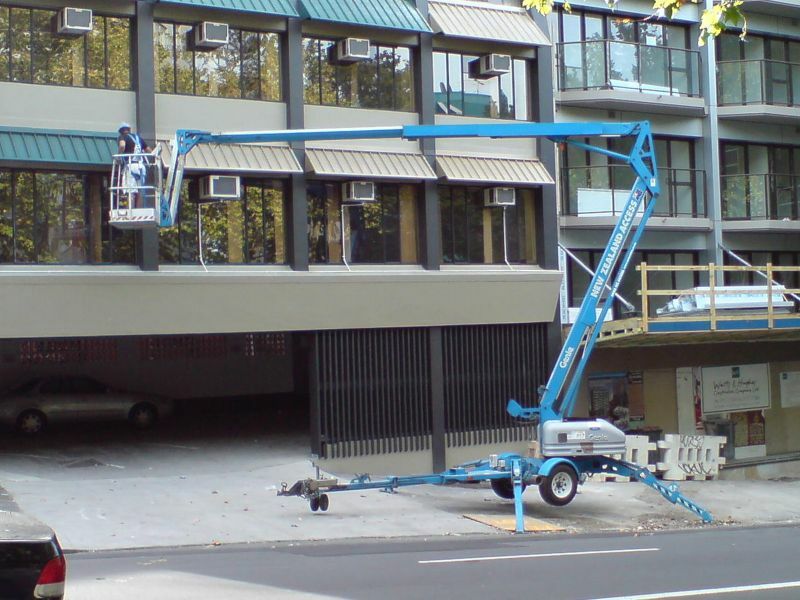 Aerial work platforms are also defined by the way in which they move (or are moved). These AWPs are usually smaller, and cannot move under their own power. They tend to be towed behind a motor vehicle when not in use. Small non-powered AWPs can be light enough to be transported in a pickup truck bed, and can usually be moved through a standard doorway. These AWPs are also usually relatively small, but have some sort of drive, which however is mainly used to move within the working area, and is not intended for long-distance propulsion. These these midsize or large AWPs are similar to wheeled, powered AWPs, but are tracked to provide them with the ability to move through rough, unstable ground, such as construction sites. While having much more powerful engines, they still are not usually intended for road travel. These AWPs are usually larger, and are mounted to a truck or van (or potentially railcar ) base. This provides them with stability (though they may still use outrigggers to stabilize themselves, especially for heavy loads or long boom lengths), and more importantly, allows them to travel on the road or rail net once collapsed. In addition to by the construction industry, they may be used by fire brigades, utilities companies, or window cleaners. These AWPs are popular throughout the UK and Europe. They can be supplied with either wheeled or tracked chassis and are distinguished by their multiple spider-like outriggers which serve to stabilize the AWP. The outriggers allow the machine to have relatively low weight but maintain great boom lengths, allowing them to be used on ground which is delicate and / or cannot take large point loads. They are also very compact when stowed, allowing many to enter buildings through normal doorways. Tracked versions are widely used both internally (with non-marking rubber tracks) or externally. A large scissor lift in extended position. Note: While the following was written for scissor lifts, much of the information applies to other AWPs as well. 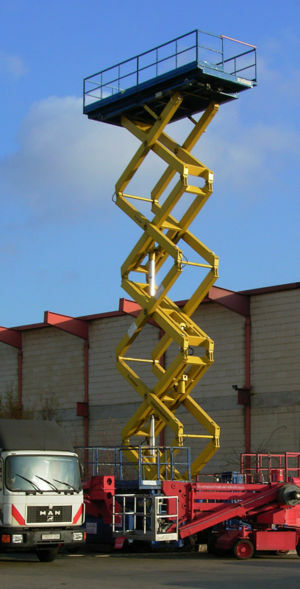 A scissor lift uses a series of folding supports, bolted together in a cris-cross 'X' pattern, to lift a work platform many feet in the air. The upward motion is accomplished through use of either an electric motor or a gas or diesel engine, which drives a pump and pressurizes hydraulic fluid lines. The pressure presses the outsides of each set of supports together, elongating the crossing pattern vertically and providing lift. No pressure is required for descent; a pressure release valve is activated electronically from the controls mounted on the lift platform. Should this electric valve fail, there is a manual release valve on the base of the scissor lift which can be pulled to release the pressure and lower the lift at a safe speed. Normal operation of a scissor lift begins with the operator walking around the lift to make sure there is nothing visibly wrong with the equipment. The operator then climbs a small ladder to the lift platform surface. Usually the operator must duck underneath the bars of the enclosed platform. In accordance with OSHA standards, the user fastens a safety chain around the side of the platform from which he or she entered. This is designed to replace the safety rail that would normally surround this area. After checking ground clearance, the operator navigates the lift to the work area and raises and lowers the platform via electronic control. The controls of a scissor lift usually consist of a joystick and mode buttons, as well as a 'stop' plunger (also known as an emergency stop switch). The operator pulls the switch outward, and the scissor lift controls go through a very brief battery and function self-check. If any problems are detected (battery undervoltage, motor failure, etc.) no functions of the lift will operate. If all systems are found to function well, the operator may proceed to press a mode button, of which there are usually only two mode buttons: Drive and Lift. Advanced models may have more, such as ones which allow for lateral platform movement. The joystick may have only forward and backward movement, or may have full cardinal direction movement in more advanced models. The joystick also has a trigger, which acts as an "execute" switch for commands given by the operator. Atop the joystick, there is often a smaller rocker switch which can be controlled with the thumb, setting wheel direction. In this mode, the operator pushes the joystick away from himself and holds down the trigger to move the entire scissor lift forward. To go in reverse, the operator pulls the joystick towards him or herself and again holds the trigger to execute the move. The joystick is pressure sensitive, and the farther from center the operator pushes or pulls, the faster the machine accelerates. To turn the wheels, the operator uses his thumb to press left or right on the rocker switch while holding down the trigger. This can be done while moving in forward or reverse, or while standing still. 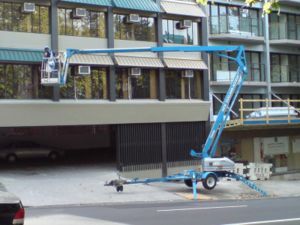 The scissor lift computer will not allow a sharp turn at full acceleration, however. In this case, the rocker switch is simply ignored by the lift control. When the platform is extended (lifted), drive motion is limited to only a low speed. Depending on the tilt, balance sensors may prevent the lift from driving at all. When the controls are in lift mode, the operator uses the joystick to either ascend or descend on the lift. Pushing the joystick away from the operator raises the lift, and pulling towards the operator lowers the lift. Again, the trigger must also be held down to execute these moves. Like in drive mode, the joystick is pressure sensitive, and the farther from center a joystick is pushed or pulled, the faster a user will ascend or descend. There are limits, however. Raising the platform can be performed much faster than lowering, partially due to the fact that raising involves an active hydraulic operation, while lowering is simply the steady release of pressure. In no case will the electronic controls allow such a rapid ascent or descent as to harm the operator. The rocker switch is inoperable in lift mode. As noted above, on level ground the lift can be driven in an extended position at slow speeds. The standard scissor lift has numerous saftety features. By its design, a lift in extended position (and even, sometimes, in retracted position) is at risk of tipping over. Many safety features deal with this problem; others are designed to avoid damaging the equipment itself. Most scissor lifts have rails that enclose the work platform. One side of these rails may be replaced by a hinged door or a chain to allow the operator to enter and exit the work platform conveniently. Some scissor lifts only have one run of rails, but most have a "double rail" system, where one rail runs around the platform at knee-height, and another goes around the platform at waist height. When a scissor lift is raised, counterbalance bar weights underneath the machine may automatically extend and adjust to steady the machine and reduce the risk of a tip-over. On larger machines, the lift may include legs that either extend automatically or are extended prior to use of the lift. Similar balance mechanisims are seen in some cranes and other heavy equipment. When the platform returns to its base, the weights are automatically returned to a "drive" position within the scissor lift housing. The scissor lift contains a variety of tilt sensors. The most commonly activated sensor (especially with two people on a lift), will cause the machine to refuse to raise the platform beyond a certain height. Sensors within the machine detect that weight on the platform is off balance to such a point as to risk a possible tip-over if the platform is raised further. Another sensor will refuse to extend the platform if the machine is on a significant incline. Emergency stop buttons (or "plungers") are located on both the operator control panel and an override control panel on the base of the machine. In the event of any malfunction, power can be cut completely by pushing the button inwards. Often times, the operator will activate his emergency stop buton to "park" the machine so it cannot be accidentally activated. This also helps to conserve battery life. In the event that the electric pressure release valve fails and the machine cannot be lowered by the operator, a manual plunger on the base of the machine can be pulled outward to release hydraulic pressure at the same speed as if the operator was descending by electronic means. In addition to the manual pressure release, most scissor lifts have a set of electronic controls on the base that will perform the functions of the controls on the work platform. These controls are used in case either the platform controls fail or the operator becomes incapacitated for some reason. Each time the lift controls are started (such as when the emergency stop button is deactivated), the lift will go through a very brief self-check. The battery is checked to ensure that it has a proper charge, and motors and other components such as tilt sensors are checked for electronic failure. Any active sensor at the time of the self-check is considered to be a failure and requires that the controls undergo a power cycle to clear the error. For example, if the lift was powered-on while the platform was extended and off-balance, the machine would sound an audible alarm and refuse to operate. A power cycle would be required to clear this condition. This sensor recognizes the physical lifting limit of the hydraulic pump, and will refuse to lift the platform when a certain weight limit is exceeded. This sensor is designed for protection of the pump motor, and is seperate from the balance sensors designed to protect the safety of the user. This sensor will disallow operation of the scissor lift when it detects that the battery is not providing a set minimum voltage. This prevents a variety of problems that could cause both motors and electronics to fail.